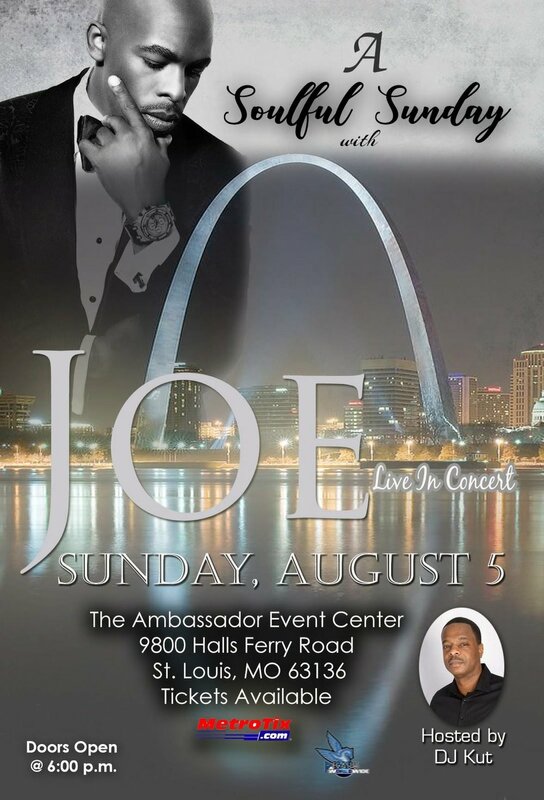 BACK BY POPULAR DEMAND ''JOE'' LIVE IN CONCERT SUNDAY AUG. 5, 2018 @ THE ALL NEW AMBASSADOR..HOSTED BY 95.5 DJ ''KUT''..THIS WILL BE A NIGHT OF SOUL..SO MAKE PLANS NOW!! TICKETS ARE ON SALE @ THE AMBASSADOR BOX OFFICE FROM 10am/7pm..M/S..YOU CAN ALSO CONTACT MRS. RAE WHITFIELD @ (314) 265-4609..TICKETS ARE $50 VIP..$40 GEN. ADMISSION...PLEASE SHARE!..IF YOU NEED A PROMOTER TO PUSH YOUR EVENT CALL JOJO OF 2JO'S ENTERTAINMENT..@ 314-496-9358..THE HOTTEST PROMOTER IN THE LOU..THX..